With so many species of wild birds visiting our gardens in the UK you may be wondering how to best meet all their individual feeding habits, so here at Peckamix we’ve put together a quick overview of the best ways to feed your garden birds to give you hours of entertainment watching the unique characteristics of each species. There are three main ways to feed the birds in your garden; from a bird table, from the ground, and from a hanging feeder. Each species of bird has a preferred method of feeding, so by just offering one of the feeding options, you will be missing the opportunity to see a wider range of birds visiting your garden. For example, Blackbirds, Thrushes and Dunnocks prefer to forage on the ground so you are unlikely to spot many of these birds eating in your garden if you only supply hanging feeders. To encourage ground feeding birds, such as the Fieldfare and Redwing, simply sprinkle food suitable for ground feeding birds onto a low ground table or straight onto the ground. Our All year ground and table mix is perfect for this. Remember to only put out as much food as will be eaten in a day to discourage pests. Bird tables are a traditional way to provide food for wild birds. Robins will happily feed from a bird table or a low ground table. Some bird tables have sheltered roofs which ensures food stays dry and fresh. It is important to remove leftover food daily and to keep up good hygiene practices, this helps to prevent the growth of harmful bacteria and reduces the spread of disease. 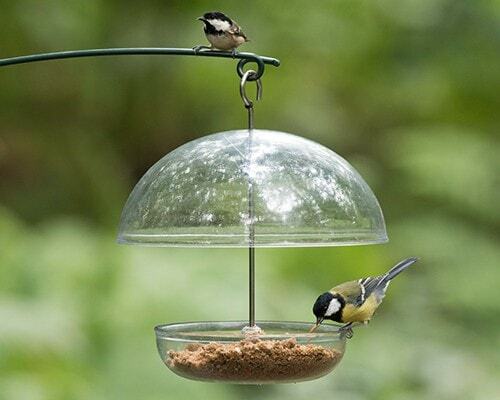 A wide range of birds will happily eat from a hanging tube feeder so these are a must have for all wild bird enthusiasts to have in their gardens. Hanging tube feeders can either be made from metal or plastic, both are perfectly functional materials so its up to your budget and personal preference which material you go for. All our hanging feeders we have in stock are great quality and are designed to last, combine any of them with our Feeder Tray to catch dropped husks to keep your garden tidy. Other hanging feeders such as our I Love Robins Feeder will attract non-clinging birds such as the Robin. Specialist seed hanging feeders, such as our Bird Lovers Niger seed feeder, will add variety to your garden attracting finches and extend the menu for your feathered friends. Hanging mesh peanut feeders are a must if you wish to feed whole peanuts, the mesh ensures young birds cannot choke on large pieces of nut. Suet products can be fed from relevant hanging suet feeders or placed on a bird table to ensure table and ground feeding birds can have access to suet products, this is particularly important through the winter as suet is an excellent energy source for wild birds. If you perceive squirrels as a nuisance for stealing from your bird feeders, then adding Safflower to your mix via our Mix Your Own service, will discourage them as they dislike the bitter taste and will look for an alternative food source. Another solution may be to try putting out a feeding area specially for the squirrels so they leave the wild bird food alone. It is important to provide a water source in your garden when feeding garden birds as most of the foods we provide in our gardens are dry. It is especially important for wild birds to have easy access to water on frozen mornings and during hot weather. 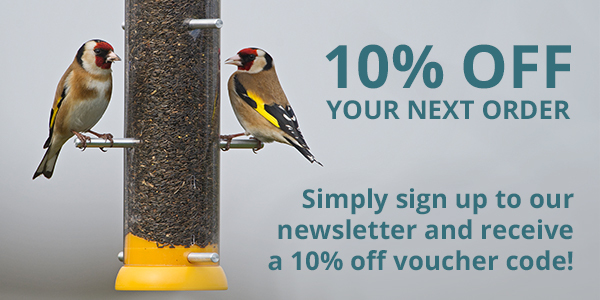 By providing a variety of feeding styles your garden will quickly be abundant with a wide variety of wild birds, so be sure to like our Facebook or join our Flicker group and send us your photos of your garden visitors, we would love to see them!